The new pattern by Deer&Doe was released last week! No collection this time, but a single pattern on which we spent a lot of effort: the Safran jeans/pants. I am a bit late to show you my version, as my life is currently pretty chaotic trying to move both across the US and back to France at the same time (long story)… But I’m still going to tell you a bit about it! 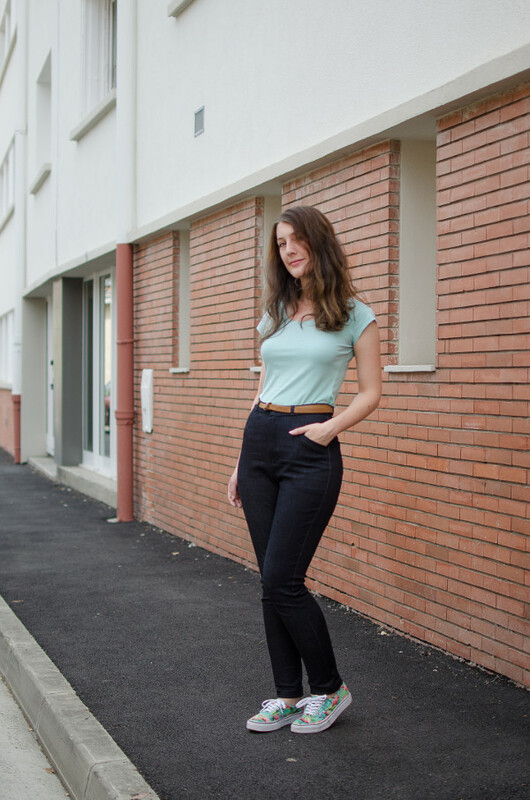 The main selling point of Safran for me is that it is truly high-waisted, meaning that it hits the natural waist – the narrowest point of the waist, higher than the belly button. 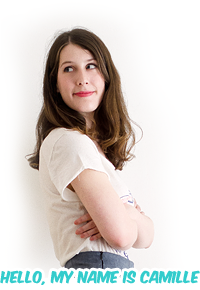 Despite what you might think given the outfits I show on this blog, I actually wear jeans very often. They’re just not a garment in which I feel particularly stylish. They tend to be more of a lazy day thing: jeans, a printed t-shirt, a pair of flats, and that’s it. I had great hopes at some point that I would someday find a retro high-waisted pair of jeans in ready-to-wear, but I have given up on this a while ago. 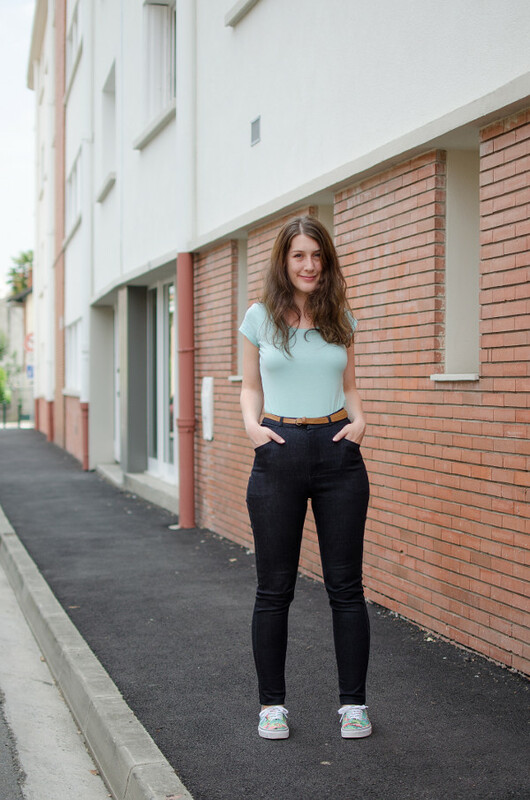 With nearly 40cm difference between my waist and hips (66cm waist / 83cm high hips / 103cm low hips) there is no way I can find a regular pair of pants in which I can fit my hips that doesn’t gape at the waist, let alone high-rise pants! This one has 30% stretch, which is super comfortable. I can clearly feel the difference with the 20% stretch fabric used for the shop sample. Here I can raise my legs, squat down, and just go crazy in the street without feeling constricted. The only issue with this fabric is that the white weft threads are showing when the fabric is stretched at the seams, which is mostly visible at the center back. Well that, and the fact that I followed the advice of the Cone Mills denim kit and washed it with vinegar to set the dye, and that now I have a pair of jeans that smells like boiled eggs no matter how much I wash it (grandma protip: a spoonful of vinegar in boiling water will prevent boiled eggs from leaking!). Anyway I’m not here to talk boiled eggs, but to show you Safran in action. 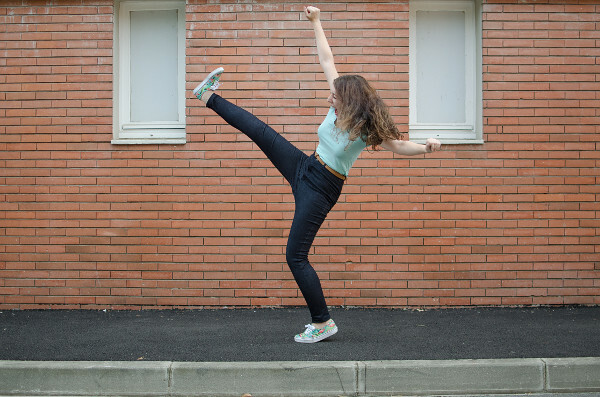 For even more stunts, check out the presentation video put together by Eleonore. Conviced? Me too, and after searching for suitable fabrics all over the internet for the Deer&Doe blog I feel like making five or six other pairs… Well not right now, since I don’t have a sewing room (or any room for that matter), but hopefully soon! I love these pants! I definitely relate to the hips-waist ratio, I have 14 inches different between my waist and hips, but only 4 inches between my waist and full thigh measurement. Looking forward to seeing more! Camille, these are awesome! 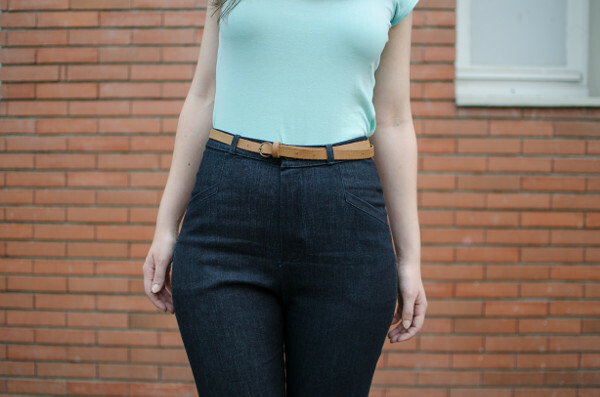 I love the natural waist length and it has the perfect retro look and fit – smashing job! Also, iit is good to know the 20% to 30% can’t be fudged around. LOVE them! I’m also dying over the polka dot pair in the pattern photos. I can’t wait to see where you sourced all your fabulous fabrics from!